We are sorry we are currently awaiting a new supply of this product. You can pre-order this item and we will despatch it as soon as it is back in stock, which we expect to be 26th April. 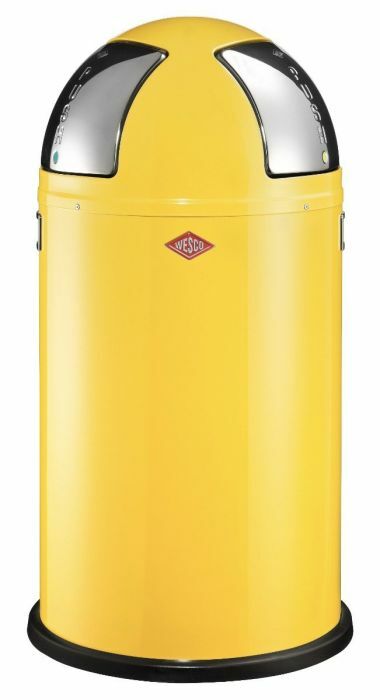 The classic Wesco Push Two kitchen recycling bin with two recycling compartments in stunning yellow will bring sunshine into your kitchen every day! 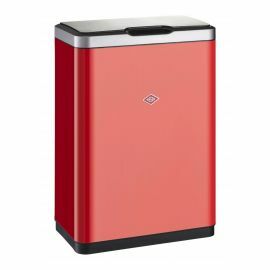 The 50 Litre capacity is split into two separate 25 litre sections with a stainless steel flaps providing access to each. 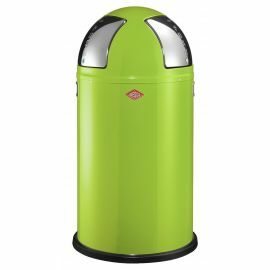 The paint finish is superb, with a powder coated process designed for durability and scratch resistance. Its build quality makes it suitable for both kitchens and commercial situations such as cafes or offices. The Push Two is an evolution of the Pushboy design classic that started off the Wesco business. 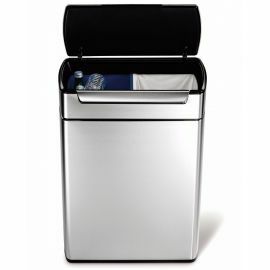 The two stainless steel flaps help you to keep different kinds of rubbish and recycling separate and this is collected in each of the two halves of the galvanised steel inner bucket. The outer shell just lifts off for access to the inner bucket for emptying and liner changing. The Push Two is made in Germany from extra strong sheet steel and all colours are powder coated for durability and scratch resistance and is found in both domestic and commercial situations. The Wesco Push Two is available in a range of great colours including Purple, Lime Green and quieter colours like Almond and White. Click here to see the full selection. If you need extra capacity or recycling options look at combining a Push Two bin with a Pushboy bin to give a 3-way recycling option or 2 Push Two bins giving a 4-way option. Both sets provide 100L of waste disposal. Take a look at our Recycling Sets for some ideas but the options are endless! Body in powder coated sheet steel. Push flaps in stainless steel. Plastic base ring to protect the floor and prevent slipping. 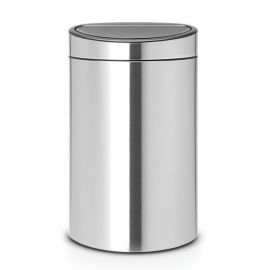 Inner bucket in durable galvanized steel: central divider to create two compartments.